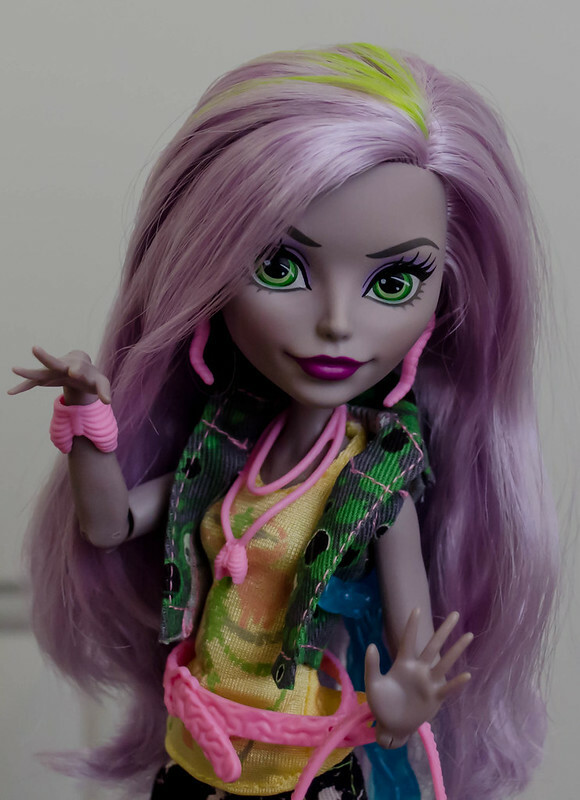 Has anyone purchased any of the reboot dolls? I wish that Mattel would have just kept the old faces. 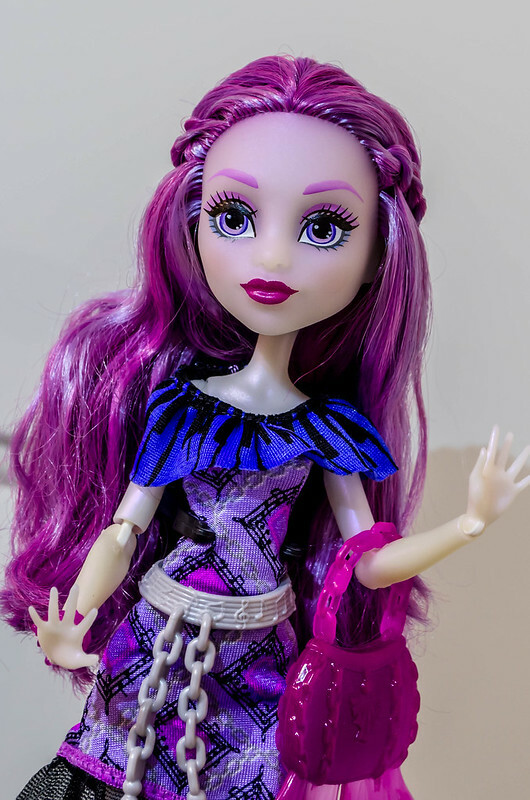 Not to mention how much I dislike the dolls without removable arms. But, if anyone has any of the reboots, please show me pics! I just got the MH Skulltimate Science Class playset - it's got a reboot Frankie. I noticed that the wrists weren't articulated, but was able to reach in through the hole in the plastic (it's got a button you push to make the science experiment frog jump in his jar, lol, so the box plastic has a hole so you can try it out), and was able to move her arm so at least she's got articulated elbows, also knees. So for the half-off at Tuesday Morning ($12 instead of $24) I thought I might check it out, lots of cool accessory bits even if I end up not liking the doll. I can always put an 'old school' Frankie in the classroom, lol. Her outfit is a printed 'lab coat' which isn't great, but I can always make her one, or get one on ebay. No pics yet, but if I decide to debox, then will post a pic. Stunning! Great pics, thanks for sharing! Thank you so much, DogMom! Reboot Venus is a beauty! Thanks for sharing Raye! 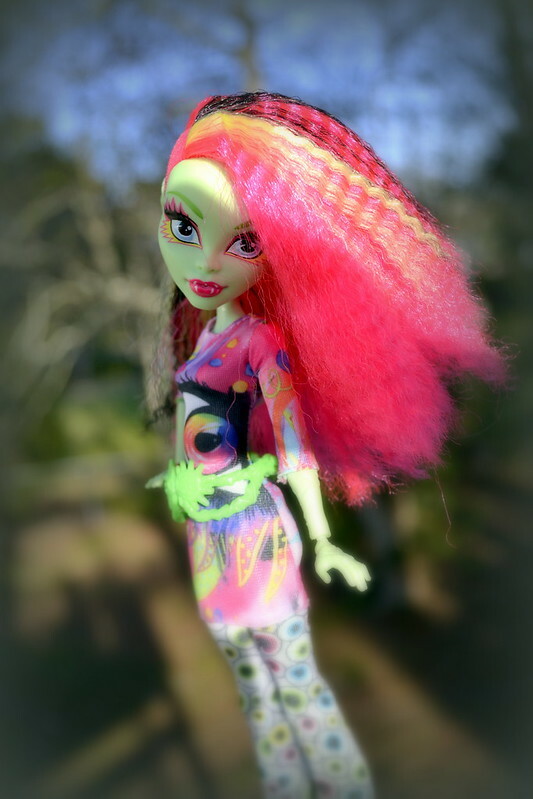 I love those photos of your reboot Venus, Raye. 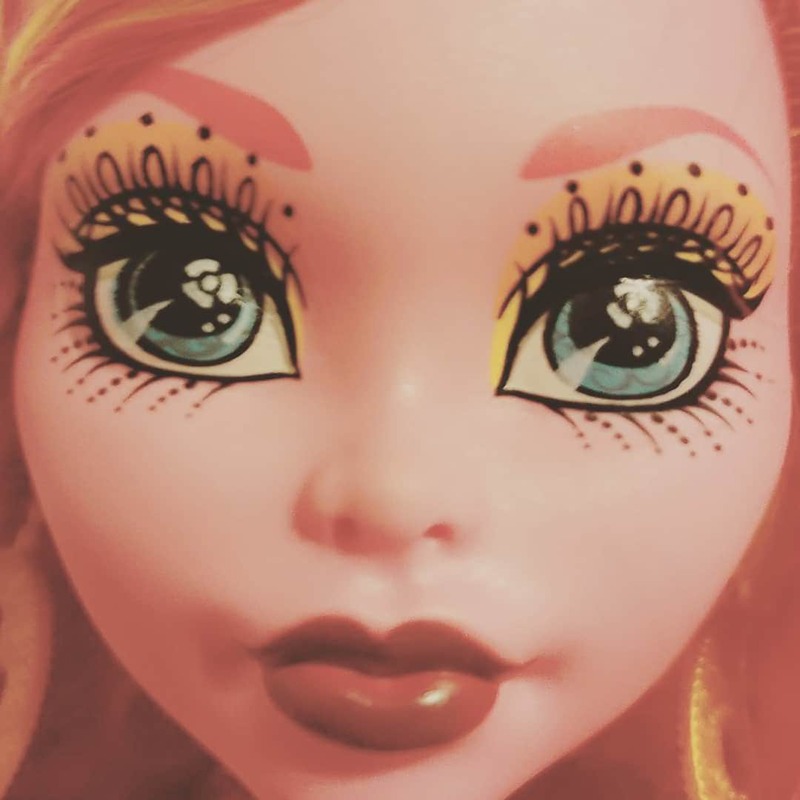 They make an already beautiful doll look that much more stunning. 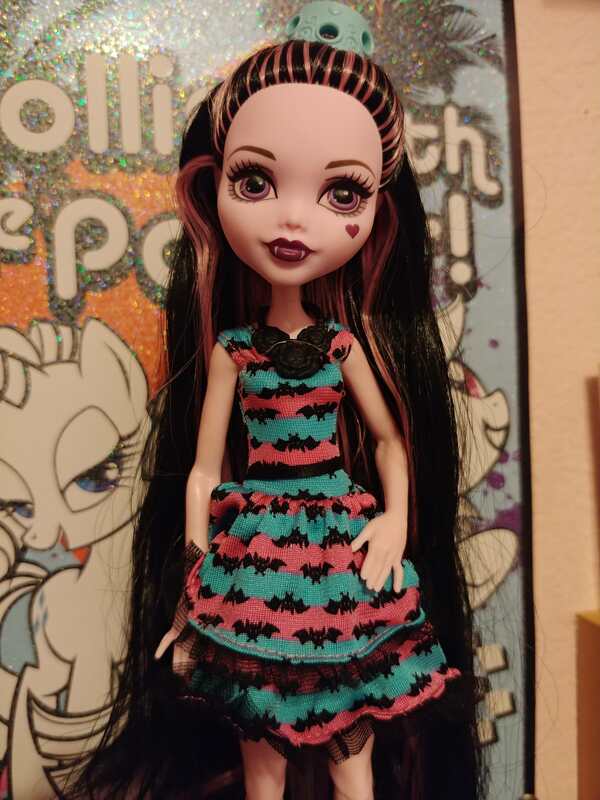 I only have one 'proper' G2 doll (I have Moanica too, but she's more G1 style), but I do love my WTMH Lagoona, I think the reboot did very right by her. Here she is, wearing a G1 fashion pack. I think that even though the reboot is not to my liking in most cases, there are some jewels. Sorry for the quality of some, I'm getting lazier by the minute, and can't always get excited enough to get the camera out and set proper props or take proper pictures. I totally blame the reboot and the less quality of stuff. This is, for me of course, the greatest jewel of G2. Which reminds me, I haven't fix her hair to make sure the curls stay in place and have less flyaways. 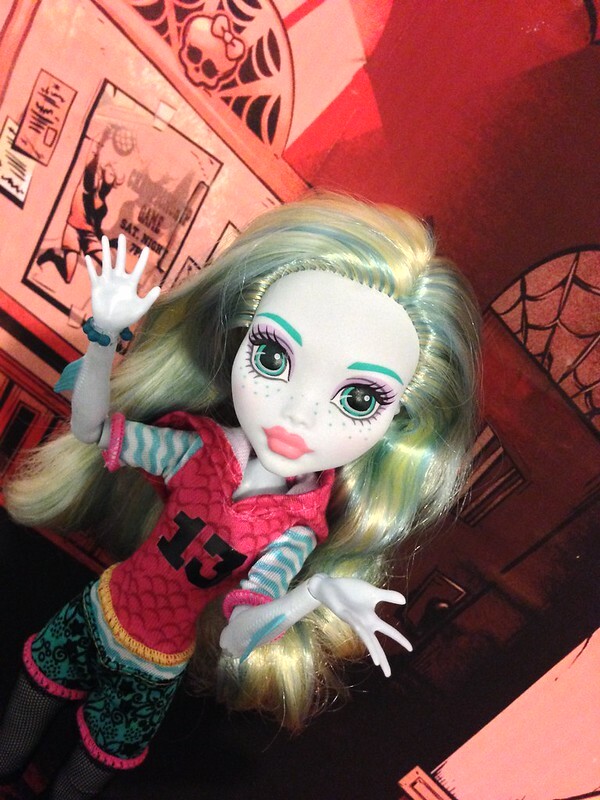 Lagoona seems to have benefit from the reboot in areas that Draculaura and Frankie now seem soul-less. 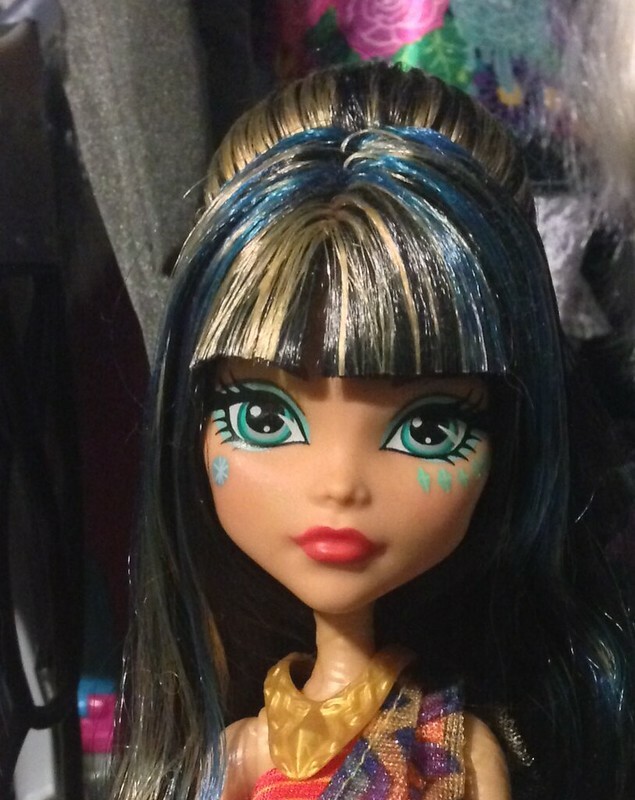 I'm not a fan of the eyes on Cleo G2, but this specific doll, along with Collector's and Music, are actually nice. Pale in comparison to Signature, 2.0 & Scaris, but still cute enough. 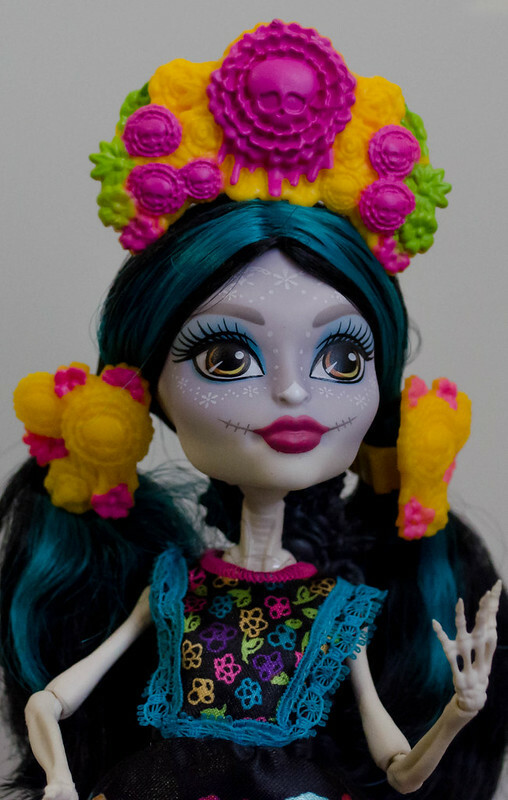 While her color combination is nice, I'm still not convince by her face nor by the fact that she keeps appearing while Spectra keeps disappearing, but I'm still trying to give this ghoul a chance. I haven't seen the Howliday special but everything in the media is making me dislike her more with each new appearance. I'm not sure if I should count this Skelita in G2, I mean the body seems exactly the same as G1, but the face follows the rules of G2. Her clothes are beautiful, and her face is nice, but I really need her nose to be black again. Another jewel. That smirk is priceless. I think her and SloMo are the dolls that benefit greatly from wonkiness. I like her palette although could live without the green. 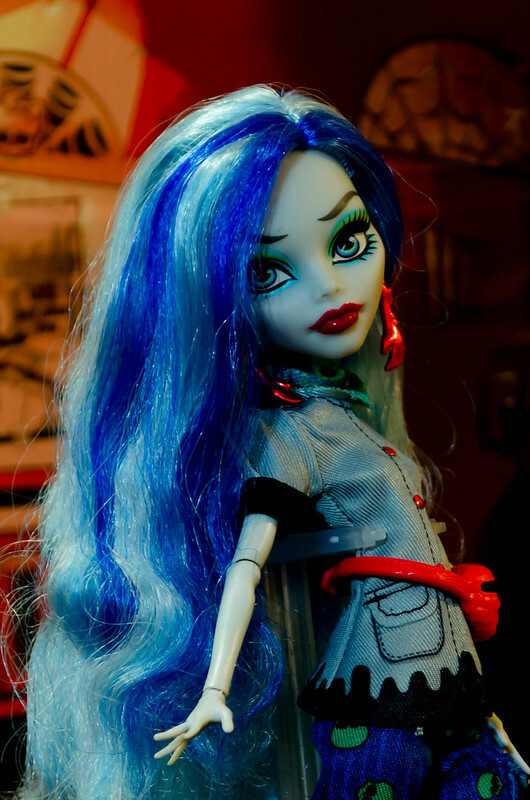 I can't hate her much for replacing Ghoulia as she has only have 3 releases, so it's hardly like she's everywhere replacing my favorite zombie. Oh, the pics of Electrified Venus are beautiful! Really, the hair crimp on her is great!! I received the reboot Frankie on a bike as a gift, the bike is an awesome prop, the doll is OK but her hair isn't great, and she has 'straight' forearms, I guess to make it easier for her to ride the bike? Anyway, I pulled her forearms/hands off to see if maybe CAM or other forearms might be used instead (ones with articulated wrists) but no go - those new reboot elbow pegs are THICK!! 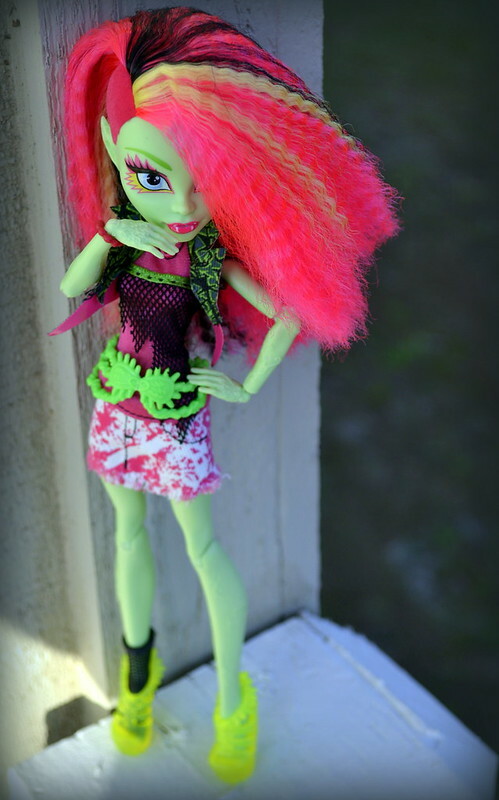 I agree about Lagoona's new look - the reboot Lagoona is lovely, I have a couple - the one with the combo scooter/skateboard and shell backpack is awesome! I do like Ghoul's Beast Pet Cleo, even if she doesn't look particularly Egyptian to me. The doll is sturdy and has solid joints. 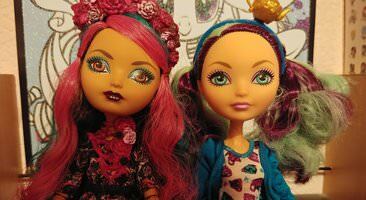 I have two reboot dolls so far! I love the aesthetic of this whole line! 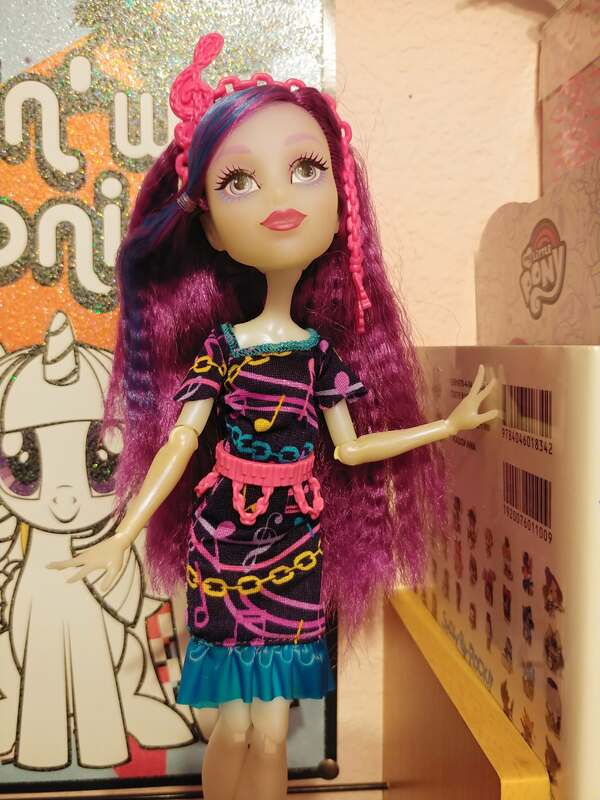 The bright colors and crimped hair feels really 80's, I'd love to get more dolls from this line, if not all of them. I don't like the lack of elbow or wrist articulation, but I couldn't resist the dress and the lighter than normal pink in her hair! The hair styling gimmick is cute, too. Though I can't for the life of me get the clamps to actually hold the hair in. The doll herself aside, I really love her stand, with her shoes that snap into it and how it attaches to her legs. Are there other dolls with stands like this? It feels very secure, I like it.